At our house it isn't unusual for us to be listening to things to busy our minds as our hands are busy with the task of the moment. Usually, however, my husband is the one setting the playlist because he has more opportunity to give a message or lecture his attention. I have two little distractions that make it a bit more challenging--unless it's nap time. As I have been working in the kitchen the last several days, I have been listening to a great series of messages recorded at a seminar hosted by the Reformed Theological Seminary in Charlotte, NC. 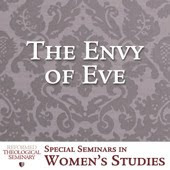 The seminar is called The Envy of Eve, and I have found it to be excellent to remind me of the state of my own heart as well as offering practical advice in how to to fight for holiness and contentment in Christ. I highly recommend this series, and I am so glad that a friend of mine shared it on Facebook. It's been very timely for my heart. Just as envy robbed Eve of the contentment of Eden, so often our covetous desires steal away our joy and appreciation of God’s work in our lives. Come and join us as we seek to replace our covetous desires by learning the secret of contentment in all circumstances.